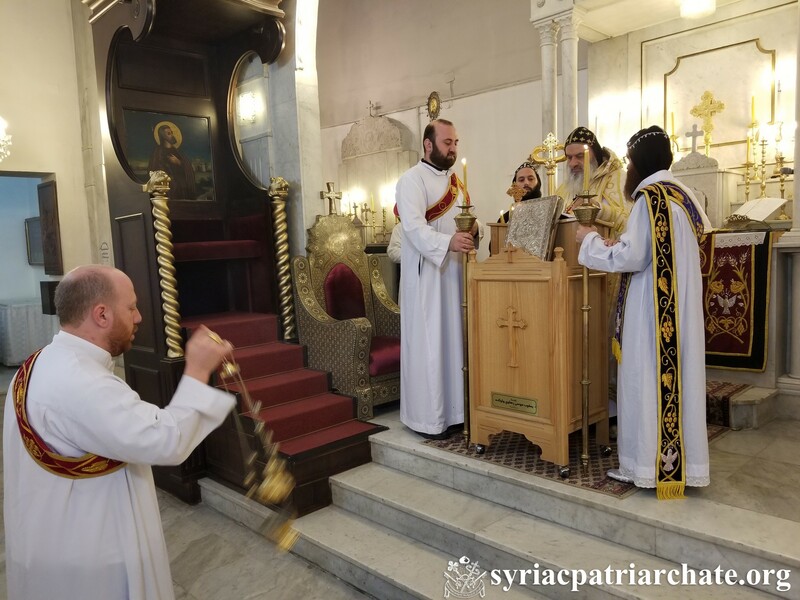 On Sunday October 21, 2018, His Holiness Patriarch Mor Ignatius Aphrem II celebrated the Holy Qurobo at St. Georges Patriarchal Cathedral in Bab Touma, Damascus. 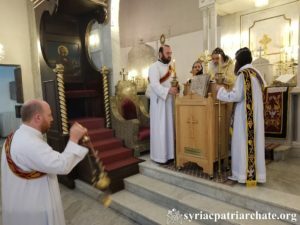 He was assisted by His Eminence Mor Timotheos Matta Al-Khoury, Patriarchal Vicar in the Patriarchal Archdiocese of Damascus, and Very Rev. Fr. Patrick, Director of Barnabas Fund foundation. In his sermon, His Holiness spoke about the importance of readiness, especially that of a priest who is responsible for the salvation of his soul as well as that of all his parish. His Holiness invited the faithful to not focus on what is for the flesh, for the Lord is Faithful to give all who ask from His grace. He also spoke about watchfulness, instructing all to care for what is above with the Lord, and forget about what is below. His Holiness added that we are called to use our gifts and abilities for the glory of God’s Name, and learn from the parable of the fool rich, who, despite working hard and with loyalty, focused on this life and forgot to think about eternal life. His Holiness considered that this life gives us the opportunity to work for our salvation and that of the others. He invited all to trade wisely to win eternal life and build for themselves houses in heaven. His Holiness then welcomed Fr. Patrick, noting his efforts in serving the church, especially through charity work. He finally announced the opening of the academic year at Antioch Syrian University, thanking the Lord for this great grace, and praying for ASU to be a great center for education.